Why not try the Hive Beach café at Burton Bradstock, if you are feeling adventurous you can walk there from the cottages along the coastal footpath via Abbotsbury – about 10 miles. The seafood is spectacular particularly the Crab and the seafood platter. Also does a very good breakfast and coffee/tea throughout the day. The café looks out over Lyme Bay and you can relax on the beach and even go for a dip in the sea. 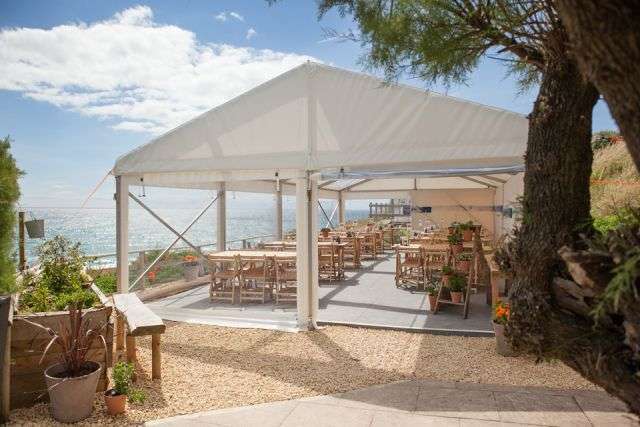 If you are looking for a slightly more formal restaurant to celebrate a special occasion or just for a romantic evening The Club House restaurant located on the banks of Chesil beach at West Bexington is fantastic for seafood. If you head east from the cottages along the Coastal footpath you will find the Crab House Café on Ferrymans Way heading towards Portland, famous for it’s local oysters. This is a very relaxed restaurant overlooking the Fleet and Portland harbor but well renown for it’s fabulous seafood. Situated a couple of miles to the East of us Weymouth is famous for its safe and sheltered sandy beach with lovely clear waters. The sea is very gently shelving so remains shallow for a long way making it very safe for kids. Hire a peddalo for an hour and explore the bay and admire looking back at the 17th century harbour and Georgian seafront. 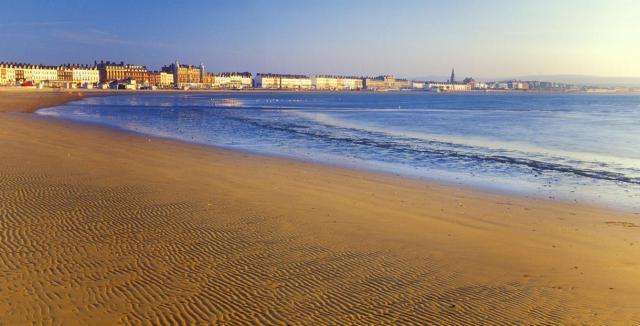 Weymouth Beach has also been announced as #1 beach in the UK in the TripAdvisor Travellers’ Choice Awards for 2017 and is also ranked 9th best beach in Europe! The beach at West Bay (Broadchurch fame!) is probably better for good swimmers as it shelves quite steeply on a pebbly beach but the water is again beautifully clear and clean. Find an ichthyosaurs or a plesiosaurs! You can’t come to Dorset without taking part in the county’s best known activity – fossil hunting! The beaches to the west of our cottages are littered with fossils from the Jurassic Cliffs. 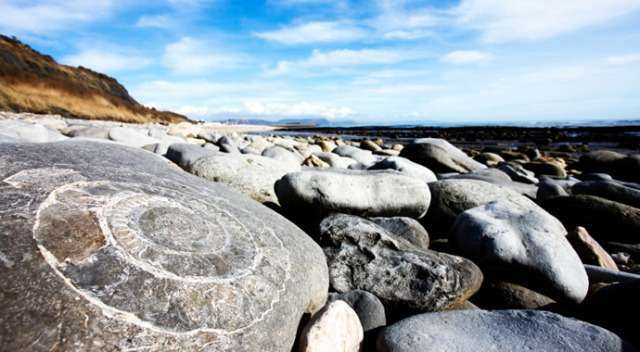 Visit the Lyme Regis Museum where you can also take part in an organised Guided Fossil walk. Head to the Charmouth Heritage Coast Centre where you can find out more about the 95 miles of Jurassic Coast and uncover 185 million years of the Earth’s history. Explore our Rolling Hills by Bike. 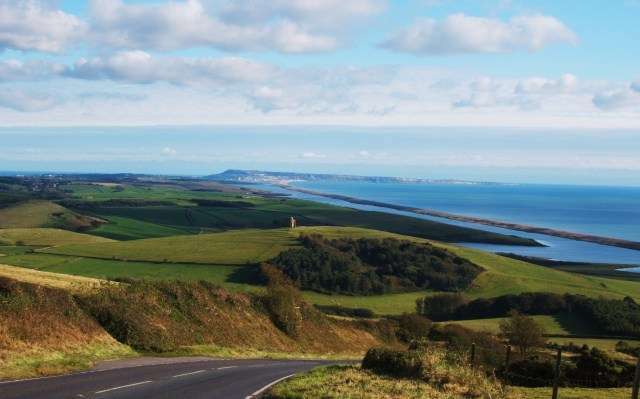 The Coastal road (B3157) heading towards Abbotsbury and Bridport is a fantastic cycle route with spectacular views. The hill the other side of Abbotsbury will certainly test your fitness. If you are not feeling quite so energetic why not try an electric bike from Jurassic Cycles and take part in one of their organized tours. Otherwise plan your own tour and explore our tiny rural lanes and quaint country Pubs. Enjoy a Harbour Side Stroll. 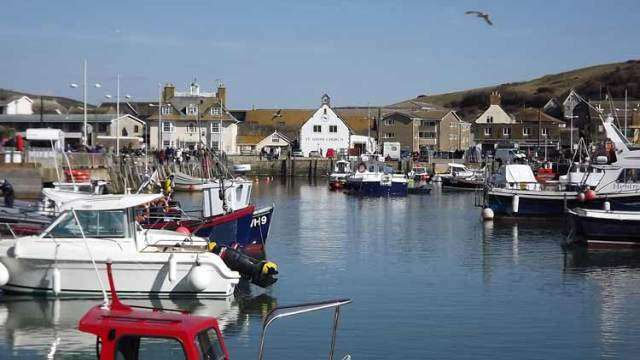 Plan a leisurely stroll around the wonderfully colourful West Bay Harbour and try your hand at crab fishing off the harbour walls. There are some wonderful seafood outlets around the harbor – Rachel’s around the far side is highly recommended. 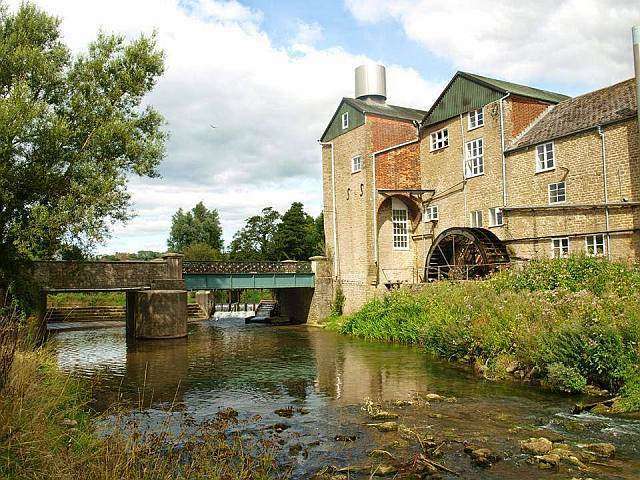 You can also hire rowing boats for a leisurely row up the River Brit through lovely meadows or head for the old station and walk along the disused rail track to Bridport for a bit of wine tasting at the local Palmers Brewery. West Bay is also famous for being the location of the recent ITV hit Broadchurch. 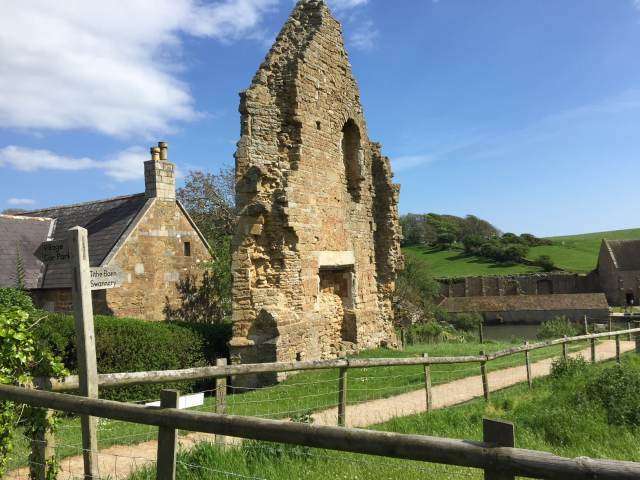 Sit in the garden and enjoy fabulous views towards the sea, St Catherines Chapel and the old Tithe barn, the Abbey House in Abbotsbury is a perfect place to enjoy afternoon tea. Also does very good lunches and is fully licensed if you need something a bit stronger. If you are feeling fit, take a walk up the hill to look around St Catherine’s Chapel and enjoy stunning views of the Fleet and Chesil Beach. Abbey House is only about 3 miles from the cottages and makes for a lovely walk along part of the Coastal Footpath. The Wishing Well in Upwey does excellent homemade food and has a lovely water garden containing a well which is the source of the river Wey! Walk on of our Sunning Trails. With the Coastal Footpath running through the farm you can join a fabulous array of walks suitable for all fitness levels. From the cottages at Langton just head due south up the large hill and from the top you will get fantastic views of the Fleet, Chesil Beach, Portland Isle to the East and all the way to the west you can make out Golden Cap, the highest point on the South Coast. 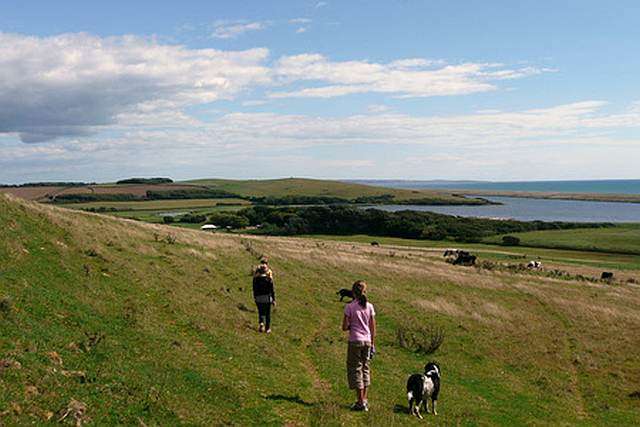 Part of the Purbeck Way can be walked by starting at Corfe Castle and heading towards Swanage on the Coastal Path. The Steam train can then take you back to Corfe. Sample Dorset’s Local Wines and Beers. Why not try some of Dorset’s award winning wines and ales. Take a tour at Palmers Brewery in Bridport, England’s oldest thatched operating brewery and enjoy sampling a few of their award winning real ales. Set in West Dorset’s wonderful green and rolling hills, Furleigh Estate makes some of the best sparkling wine in the country. They have over 22,000 vines and a purpose-built winery containing state of the art equipment. A converted barn where once cows were milked, now serves as a tasting room. Here visitors can sit and admire the views while trying the wine. Visit The Tank Museum at Bovington. The Tank Museum brings history to life, with the world’s best collection of tanks and explosive live displays and recently won the Dorset Tourism Awards 2017 Bronze Winner for Large Attraction of the Year! Exploring eight powerful exhibitions, you will come face to face with almost 300 armoured vehicles. This unique collection includes the world’s first ever tank, the feared German Tiger and the modern Challenger 2. Of note is “Battlegroup Afghanistan” which transports you to the recent frontline whilst combat veterans give their own accounts of modern operations today. Also the “Trench Experience” is not to ne missed as it takes you back in time to the trenches in the First World War. 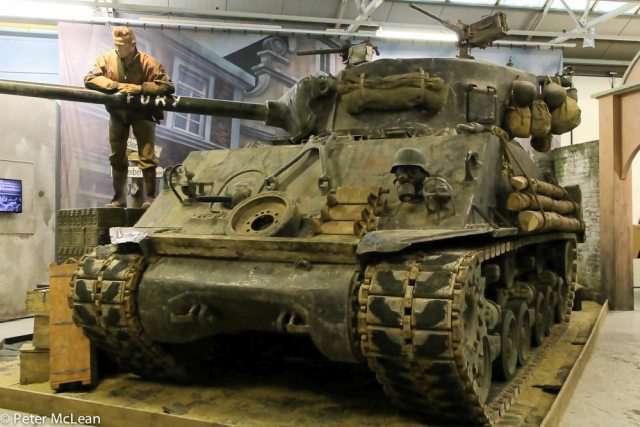 There are special events going on throughout the year at The Tank Museum including TANKFEST, Tiger Day and the Vintage Christmas Festival and Craft Fayre, as well as special activity programmes during the School Holidays. Also, don’t miss the explosive Tanks in Action displays every weekday during the school holidays. TANKFEST, on the last weekend of June, is the world’s best display of historic moving armour! With stalls, food, entertainment and activities as well, this is an event for the whole family. Visit Some of our Stunning Stately Homes and Gardens. 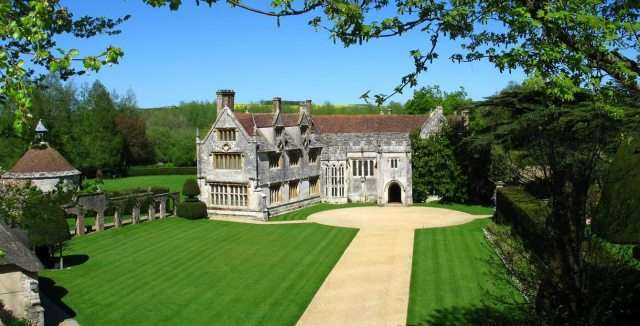 Dating back to the 15thC, Athlehampton is one of the finest manor houses and is surrounded by one of the great architectural gardens of England. Atlehampton House has many finely furnished rooms including the Great Hall, the Great Chamber, the Library, the Kings room and the wine cellar. In the West Wing Gallery you will find paintings by the Russian artist Marevna who lived in the house from 1948 – 1947. The West wing also houses a fine dining room, The Yellow Bedroom and State Bedroom, the Dressing Room and a bathroom with a copper bath. The formal gardens were built between 1891-1899 by Alfred Cart de Lafontaine and include the world famous topiary pyramids and collections of roses, tulips, chematis, magnolias and lilies. The River Piddle forms a natural boundary and along the banks you will find the ancient 15C Dovecote. Also well worth a visit are the 17th Century Italian inspired Kingston Lacey House near Wimbourne and Minterne Gardens landscaped in the manner of Capability Brown in the 18th century.